Google is apparently looking to tap into the Facebook widget ‘phenomenon’ by serving Adsense ads on third-party applications created for the site. As Steve says, the move seems to make perfect sense for both Google and developers that have yet to find a way to monetise their creations. But would it be a good thing for Facebook, which is already facing rumblings of discontent about how ads are affecting its user experience? “As Facebook starts to look like Times Square with ads on top of ads – some they control, others they don’t - it will turn the community off. Already I can’t stand it when I see ads in my news feed. That’s the problem with open platforms. 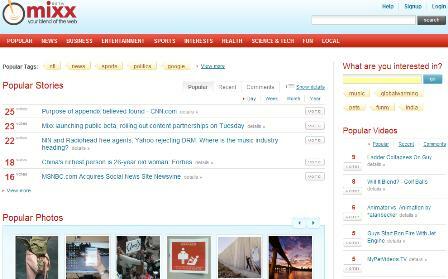 Mixx, a social news startup, launched in public beta yesterday. It is a rival to the likes of Digg and Reddit, and more ways to customise the news to fit your own preferences.